Historic Batavia, IL is a river and quarry town, known for its industrial beginnings. Many of the small cottages and cabins inhabited by workers in the mid 1800s still exist today. This home was one of them. Beginning as a 20 x 30-foot cabin, each subsequent owner built additions creating a ramshackle house not suitable for modern living. The homeowners needed the modern amenities of a four-bedroom home, complete with a large family room, kitchen, dining area and basement fitness room. Our challenge was to create a home that met the owners needs but didn’t overpower the smaller-scale houses in the neighborhood. To achieve that, we demolished all the previous additions, leaving only the original cabin to become the home’s living room. A tower was added to become a counterpoint to the large additions in the back. The home’s playful motif is played out through inverted columns and a concrete landing, stamped into a wood pattern. Banding helps break up the spaces, and divides different materials and colors. Compound miter joints beautifully articulate the outward sloping exterior walls. To create a transition between the original part of the home with the new additions, we created a glass-like link of large scale windows and skylights. The home’s interior features craftsman-style decorative columns, recessed art niches, and a structural glass floor that lets light into the basement below. To meet the client’s request for a private space, we added secret attic room, accessible only through the master bedroom closet. 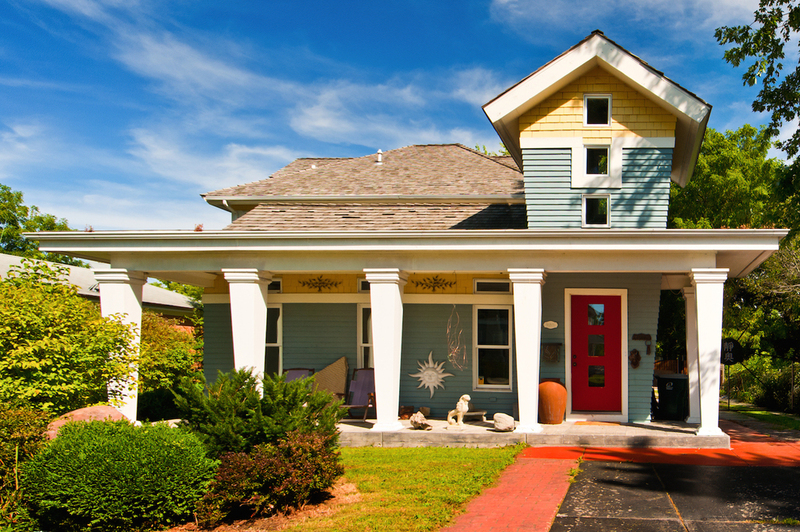 The whimsical tower, coupled with the bold color scheme and inverted columns, has earned the moniker “The Dr. Seuss House.” It has been featured on The Batavia House Walk.